It’s a common scenario for guitarists: you’ve joined a new band that calls for a new sound, or you simply want to change things up a bit – yes, it’s new amp time! But once you’ve decided which sounds you’re after, there’s another question to answer, and it’s this one: do you want the combo version, or the head and cab option? It’s a conundrum that confounds many players, so we got to wondering why amp makers often offer both, and – crucially – which is best for you and your gig? Well, the answer to the ‘why make both?’ question is less about stage performance, and more about personal preference. Every guitarist is different, and every player demands something different from his or her rig. It might be a sound thing, or a simple matter of convenience or portability – and, as players, it’s great to have the options to choose from before you part with your hard-earned cash! But sound is also a key issue when choosing a gigging amplifier, and combos and heads and cabs – even those which share the vast majority of their technical specs – can perform surprisingly differently at rockstar volumes. Indeed, if you’re of the rock persuasion, there can be nothing that compares to standing in front of a hard-working full-stack as you devastate your crowd’s hearing at 100 paces. It just wouldn’t be the same if you were to crank your 1×12 or 2×12 combo, would it? Well, no, it wouldn’t, and there’s a reason for this: the bigger the cab, the more air you’re going to shift, and the more low-end thump is going to be present in your all-important tone. That’s why, when you go to rock and metal shows, the guitarists are almost always plying their trade in front of a sizeable head and cab setup. It doesn’t have to be a full stack, of course. These days, we’re mostly all micced through the PA anyway, and a massive 4×12 is not at all necessary. In fact, in almost all situations – anything barring stadiums, really – your stack is probably going to be too loud for the venue. The fact is, if you’re playing your local bar and you crank your 100-watt head and 4×12 cab, you’re going to blow everyone’s head off, and risk damaging your hearing. Thankfully, the recent lunchbox amp trend – which has resulted in a wealth of brilliant little heads that roar even at living room levels – has given head and cab lovers a new lease of onstage life. But more on that later. Combo amps remain a totally viable option live, and many country, pop and blues players still turn to them without hesitation. Alright, you possibly won’t see Slayer using one, but they’re plenty loud enough for most venues, even before you consider hooking them up to the PA. There are certain tonal advantages associated with combos, too. For one, they usually have an open back (as opposed to cabs, which are usually closed) giving them an airier sound. Again, this can be useful for subtler playing styles. Combos are also always going to give you a nicely matched and rounded tone. After all, they’re just your head and cab parts in the same box! 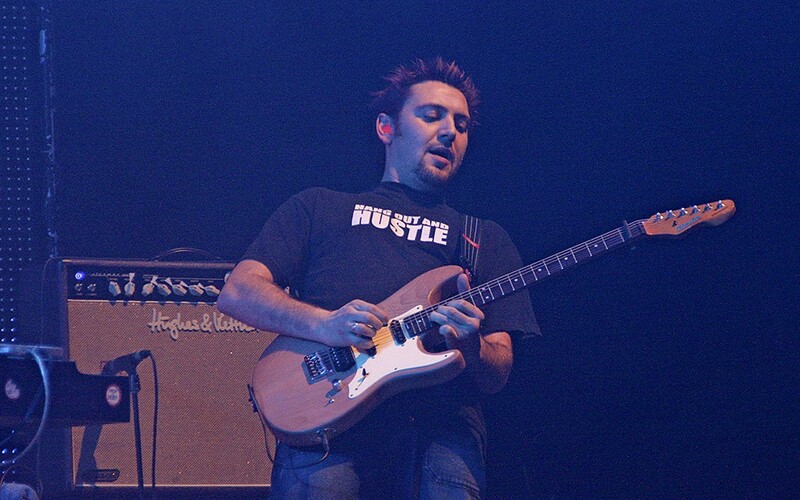 With the sheer amount of different heads and cabs to choose from – not to mention different impedances to puzzle over and the prospect of having to go onstage with your own head and a foreign, mismatched cab – a simple combo, with everything always in its right place, can be a breath of fresh air to the stressed musician. Sound-wise, then, it seems to be a case of choosing the amp setup that works best for your style of music. Do you down tune, whack up the gain and volume and incite a circle pit at every show? If so, a head and cab is most likely going to sound right up your street. If your tastes are milder, though, a combo’s the classier and cleaner way to go. But, as we said before, buying a new amp is not just about sounds. The hassles of modern life mean that convenience is also a major consideration for many of us, and in that regard, combos and heads and cabs are different kettles of fish. For starters, amps are heavy. Like, really heavy, especially if you’re packing plenty of watts. If you’re a more senior player, not that strong, or happen to live in a place like New York – where you’ll have to lug your rig up multiple flights of stairs for many gigs – some combos can be out of the question. That might sound wimpish and daft, but let’s put this into perspective: some classic combos have weighed in at over 100lbs/45kgs. And they usually don’t have wheels, like many cabs. That’s a whole lot of weight to manage with one hand and a lousy carry handle! A head and cab, though still heavy, can help split this weight up, even if it might result in an extra trip to the van. We reckon that would only put off the laziest of axe slingers. Then there’s the stage management side. We’ve already said that a big head and cab can be overkill for all but the loftiest of venues, but one advantage of them is that you’ll always hear yourself on stage! With combos, this can be more difficult, even though their sound is more directional. If you’re playing a gig with a dinky combo and the stage monitors are not up to scratch, you might be in trouble. If you need to hear yourself, slant the combo so it points directly at your stage position, or elevate it more by getting up on a stand, or even a chair – whatever you can lay your hands on! Playing live through a combo might not give you the instant rock god status a head and cab can, but a great many guitarists still choose them for their simplicity and their airy tones. This brings us to the last point, and it’s one we absolutely can’t forget. Coolness. As sad as it may be, looks matter to many of us when we’re up there strutting our stuff. And even if we’re not vain about our own appearance, we want our gear to match our style and our band image. 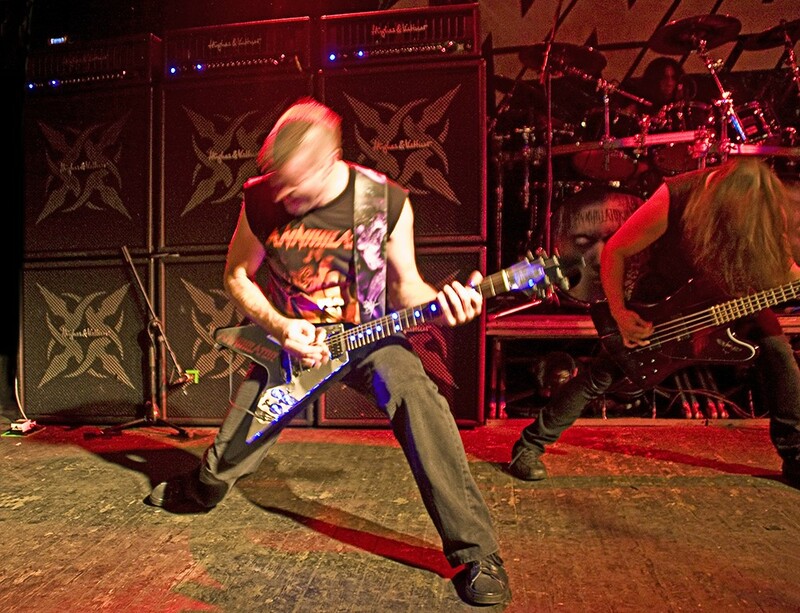 If you’re playing country, you’re not going to rock a pointy 8-string doublecut through a full stack. At least, we hope you’re not! It just wouldn’t feel right, and if you don’t feel right onstage, you’re not going to play a great show. So again, if you’re in the market for a new gigging amp, get your thinking cap on, go out and explore your options. There’s a wealth of amps out there in a huge variety of formats. And yes, we’re well aware that we haven’t even touched on racks and digital modeling gear in this post. There just wasn’t the time this week, although there will be soon. But we’d love to hear your thoughts on what’s best. Do you go all out head and cab, or are you a combo fanatic? Or do you mix and match depending on your next show? Do you pick your amps purely because of tonal considerations, or is portability your key concern? First published: August 22 2014. Most recent update: October 12 2015. Lot of thoughtful and interesting stuff here. I would like to add that there one factor that supports head & cab for a choice for many guitarists: Freedom to experiment. While there are plenty of great combos out there, and theyre much easier to play, tinkering with your setup becomes much more fun with heads and cabs compared to solid and well designed combo. So when can we start buying GrandMeister Deluxe combos ? I can think of one or two bands that still go the full-stack route, even on small stages: Japanese experimental drone metal group Boris, for one. Their guitarist Wata uses 3 100W Orange amps on stage, she additionally has a 1000W orange bass terror stack for the low end. For my part, I mostly record and have one small 6 Watt amp head I built myself. I either run it into a 1×12 open back cab, or into an over sized 2×12 bass cab if I need a *big* rock or metal sound. It means I can get the sounds I need without going deaf. My first amp was a 100W monster that just never got used to its potential, because it was too loud. I started off with 4×12’s, but for most venues they’re too big and you just can’t run them hot enough without blowing people’s heads off. So then I move to 2 X 2×12’s, gave me the option of a full stack or half stack but again really too big for pub gigs. So, I shrunk further playing a diezel head through two oversized 1×12’s, sounded huge but most of the time I ended up only taking 1 can. Next up was a fender twin, glorious sounding amp but weighed a ton!! I now have a H&K Duotone(there doesn’t seem to be much love for these?). I’ve realised that every gig I do my cab is mic’d up and I use in ear monitors so stage volume isn’t an issue. Let the pa do the hard work, PA systems these days are much more efficient, keep stage volume to an acceptable level and save your ears and just as important, your back!! I prefer combo’s. I own two 50 watt tube heads but in my world of playing gigs I prefer the ease of travel and breaking the stage down between acts. I also like the open back on my 50 watt 2×12 main stage amp because of the coverage… there’s a lot less need for my rig to be in my monitor mix (or anyone else’s mix) leaving room for clear vocals. No extra tweaking of the amp at the monitor console usually means a quicker sound check. We usually play 40′ event stages as a main or opening act and I still love my combo rig. It’s just one easy to handle case, pedal board and guitar for me to worry about. I’m usually on and off the stage in one trip! Thanks for the cool feedback Mike. Especially interesting to hear the reasons for you favoring an open-back combo instead of a closed cab. Could be some of Levinson’s Blade guitars. I’m currently in the market for a new valve amp, and am very taken by the TM18 – it has all the features I want, but most importantly power soak – there are very few amps on the market that let me drop the power down to 1W, which is necessary due to my living arrangement. So coming back to the topic of the article – I have two choices – either I go for the TM18 12″ combo, or I go for the TM18 and the TM112 cabinet. Other than the lack of reverb in the TM18 head and the price difference, are there any real benefits or disadvantages of one over the other? Is the Celestion Vintage 30 ‘better’ than the Rockdriver 60, or are they just different? Hi Simon. Hmm, this is down to your preferences really. The speakers are just different, we’d say – a lot of players swear by Celestions (V30s in particular!) but tone is of course subjective. You like what you like, so we’d say try them both and pick the one that sounds better to you. Combo advantages? Reverb, portability, it’s an all-in-one solution. What about the head? Well, if you’re moving the amp around, say for shows, it’s easier to carry two smaller bits. You can also experiment with different cab types and speakers more easily, if that’s your thing, or show up just with your head for a show/jam and use whatever speakers are there – or go straight into the PA with the Red Box! 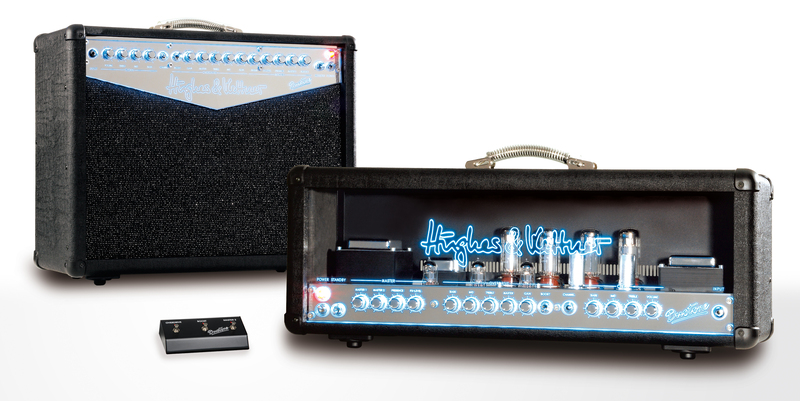 Just one more thing to think about – the TubeMeister 36 head also has reverb, and it goes down to 1 watt. Might be out of your budget range, although we’ve just lowered the TM18/36 prices anyway. Damn, we can’t work it out 😉 This guy was the guitar player for Scouting For Girls for a few years, but we can’t work out the headstock 🙁 Can anyone else help? Having read all the comments it is quite interesting to see different points of view. I started originally with an AS64 when they first came and this replace my boogie simuclass3. I loved this amp until it finally died beyond repair. Then I bought a switchblade100 combo and struggled a little as the tone was too refined. I then supplemented myself with a fender deville which was incredibly loud but didn’t rock so then went to a Marshall jvm 410C which did the business for rock and blues but lacked some of refinement on clean tones and got really noisy on hi gain settings. I have since sold the fender, the switchblade and Marshall are for sale and I now have a GM36 with the 2×12 cab. Wow! This gives you everything! I’ve only had it a couple of months so I’m still navigating through the standard sound settings, the les Paul is fantastic sounding using bank 3 abcd and the strat I’m still working on. I do still debate on getting a 4×12 as I always remember a guy demonstrating a switchblade with one and it had a rich depth tone. So this may have been my error in the first place. So while I have the GM36, I can now have the option of choosing which cab to use. My band has a keyboard player and at times I do feel getting drowned out, but mainly using a 4×12 I might just get the right balance the 4×12 still has the same footprint ,it just stands taller and is bigger. My main genre of playing is blues, buddy guy, KWShepard,Clapton,bonamassa,king king etc so would welcome any suggestion on some strat blues settings. I’ll let you know about the 4×12 when I get one! Anyone need a Marshall or switchblade? A blues sound on the GM36? Try this: Crunch channel, Master Volume up as much as you can, gain down, but using the gain as a sort of master control. Then you’ll have a warm, rich sound – and if it’s too loud, use the power soak. Keep the signal nice and dry (no reverb or FX) and it’ll be a real in-your-face blues sound! Hope this all helps, and let us know about the 4×12! I started out with a combo amp as a youngster, then moved onto heads and cabs. What I like about using heads and cabs is that it’s easier to mix and match your tone. Once you buy a head you can swap it in and out with any other cab in your lineup. It’s also useful to buy a spare head, especially a small portable one like the Grandmeister 36 to use as a backup head! Also I love to travel with the GM36 – it’s about the size of a mailbox, fits easily into an airplane overhead compartment, and always sounds great when used with the house cab. True dat! Sounds like you’ve definitely got the best of both worlds there, Tony. And it would be nice if all guitarists/musicians could be as considerate as you when it comes to gear changeover times on packed bills 😉 Keep rocking the Switchblades! I just bought a Tubemeister 18 with the 12″ & 10″ cabs. My comment after using it live with different H&K speaker configurations is that the tone stack is voiced a bit bright. Other than that, I love the overall features of the amp including the Red Box, switchable power & the effects loop. I use this amp when playing small clubs/rooms. Played a myriad of different head/cab combinations over nearly 30yrs. The pinnacle being an h&k trilogy & an oversized 2×12 cab w/ vintage 30s. Great tones to fit a variety/cover band & an all original rock group. In the last couple years I’ve started taking out different combos to better fit venues/needs & am now a dedicated combo guy! I now own a handful of 1×12 combos (fender deluxe, fender supersonic & Rivera suprema) running from 22w – 60w that I use depending on needs. I’ll never get rid of my heads/cabs because I love the big rig setup, but until the big stage calls, my recording & live setup is ONLY combo amps! Thanks for the kind words Scott! Cool to have a number of commbos to choose from, and it does seem that you’re set for anything without the need for a big head/cab setup… Sounds good to us! Great article. I used to have a solid state amp and never really liked the tone. I purchased a Peavy classic 30 combo (1×12) about 15 years ago. What I liked about it is the tube sound plus it has an extension cab jack. Somewhat recently I purchased a not so very used Peavy 4×12 cab for close to nothing and installed 2 greenbacks and 2 creamback 75s. The combo speaker was also replaced by a greenback. All I can say is the set up drips tone and I have the versatility of using both. Everything is 16 ohms so when connected its actually 5 speakers of sound but if I want to jam at a friends house I can just grab the combo. Keep rockin’ the great articles! my rig is rather simple, I realy play a Peavey Classic 50 Head, in one band on a 212 noname cab and at the other band on a 412 Peavey Windsor Cab. Allthoug the volume of the 50 Watter is max at 3 a half. Now I am a new owner to a used Peavey Classic 30 112 Combo, and I need to say the sound is near to the 50. Ok the wight also, but the play and feel is near as with the 50 and that’s my most important reason. Before I had played a egnater Rebell 20, also a super fine 20 Watts full tube, but i got lack of the secound channal, and needed to get a better opinion, so the classic 30 entered the ring. Of course the Rebell is still a damn fin usefull and good sounding amp, in it’s price range and feature it is one of the best you could get. If I had owned the Rebell 30 I think I still would own that. These are some really interesting thoughts roror, so thanks for sharing! So, if you had to choose just one for the future: would it be the combo, or the head and cab? Have a TM36 and debating on this exact issue for the GM36. But the rule of thumb for me is get the best tone, maximum flexibility in the smallest portable package possible. This translates to nothing more than a 1×12 or 2×10 whether it’s a combo or head/cab. It’s also allows getting more combos, heads & cabs if you don’t have a warehouse to store your G.A.S. And after seeing a guy blow my mind playing through a Fender Princeton with a Redbox, the days of stacks and 2×12 combos were DONE. Even with a 30w combo with a single 12″, had too many cry about the onstage volume. But I’m about to pull the trigger on a 1×12 cab made by 3rd Power that is doing some interesting speaker cab designs. Gonna be an awesome setup with the Dream Weaver head I have… tones, portable and killer looks. In 2014, does anyone really need a full stack for genuine sound reasons? Interesting Kasey, and solid state too – sounds like a great and manageable rig! We’ve plenty of amps that could get you a similar sound (if you want combos, try the TubeMeister 18 and 36 especially) but nothing solid state that matches to what you’re playing… Cheers for letting us know! I messed around with whole bunch of diff combos. Before I settled of the head. I like using the head because it allows you to run diff speaker configurations. My uncle had a 61 bassman head so I was able to try his and decided that was the amp for me. It is the circuit that defined the rock sound. 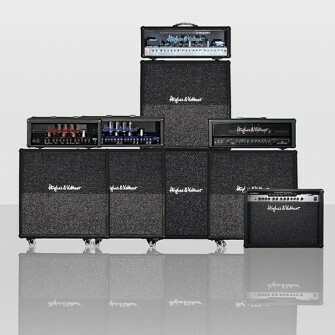 As you say in the article, some of is have both head/cab and combo versions of our favorite amps. And I’m one who does. My half stack sounds oodles better than my 2×12 combo, but the 2×12 is much more portable and weighs just a little more than it’s head version. The ONLY reason that I’ve kept the combo though, is because I want something to be able to take to friends’ houses and for impromptu band jams/rehearsals. I also just haven’t found many combos that actually sound good. At least not good enough to pay the amount being charged for them. I don’t like those airy tones that come along with them. Given the chance and with proper space, I always opt for the half stack. More sound being moved, tighter sound, and being able to hear myself always wins out. My first amp was a h&k solid state combo. I loved it. It allowed me to get where I needed to be on a budget. I now play a 63 blonde fender bassman head through a 65 silverface cab w two 12 ev sro’s. I love it. Wouldnt trade this setup for anything. Headroom spank lots of volume but still usable. This amp is great. Covers every style. I’m a rock and metal guitarist…I use an Orange Rockerverb 50 watt 212 combo. I have no problems matching the tones from my old stack, and have no problem with volume or aesthetics. I rock it just as good as a stack, and it gives me more control for feedback. Interesting, Tom – happy that there’s some rock/metal players out there like you who can bear to use a combo! Some other guys have mentioned that they can’t get the thumping bottom end from a combo (and we mentioned that in the blog too) that they can from a 4×12 – not a problem for you? I use my H&K 4×12 for rehearsal and larger non-microphone situations and a 1×12 for microphoned shows. Love my H&K. Great tone. You’re right, Ted – the head and cab image totally gives you (and the crowd) that genuine rockstar feeling. Even a big 2×12 combo won’t do that. Keep rocking the Coreblade, and thanks! Great article…and I absolutely love my Tubemeister 18 head. Simply my favorite musical purchase in 32 years of playing guitar. I’ve played virtually every amp out there and own Marshalls and Fenders and I finally found the perfect amp in the TM. I love my half stack because of its tone. I rarely push it past about 3 on volume, because it doesn’t need to be any louder, it creates such a hearty and beefy tone even at low level. It gives me some headroom to play with too should it need a little tweak on stage, that I can assure myself I won’t bottom out, or start to affect my tone. The old stereo combo I used to use was a 2×12 75w (per speaker) unit, and I would crank it, and the tone would fall apart like wet tissue after about 6 on the dial, and I would end up being drowned out by the rest of the band. It may not always be the most logistically sound way to go about gigging, but I personally don’t think it matters, especially if I only need to bring the head unit.